Quality management is about ensuring that your business’s internal processes are efficient and robust enough to support the rest of your company. It includes everything from taking orders, to storing customer details, invoicing to handling complaints. By ensuring that all of your internal processes are streamlined and are consistent throughout your organization, you will not only save time and stress, but you will also save money later down the line. 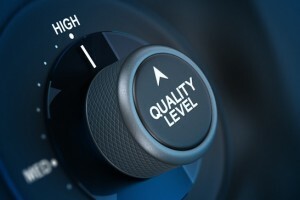 Quality management is especially important for SMEs. This is because by not getting on top of your internal processes now, you risk a chaotic environment when your company expands or changes. Imagine opening a new office or branch elsewhere in the country and one location having one set of processes and the other one a different set. This could result in a different customer experience at each end which is bad for brand consistency, and means that if ever data or information needs to be transferred between the two branches, it may end up being incorrect or incompatible. Any information or projects that slip through the net could end up costing your company money, and damage to your reputation. Trying to implement a strong quality management system once your company is beyond ten or so employees becomes increasingly difficult. This is because without procedures set in place, it is likely that your team members will simply create their own ways of doing things, and trying to change these habits can be very difficult and cause tensions. It is best to outline and implement all of your internal, structural processes now, even if you don’t need to use all of them, it means you have a starting point to work from as you grow. Many companies, especially those that are already fairly established and growing, prefer to invest in a certification for quality management systems such as ISO 9001. This takes some of the pressure off as an experienced consultant will help you to implement the correct quality management procedures for your business. While there is a cost associated with the certification, for many it is a good investment as it is far less time-consuming that trying to implement the procedures yourself while running a business. You also have an accredited certificate at the end of the process that is not only recognised in the UK, but worldwide too. Other organisations prefer to contract the services of a consultant for a short period of time, perhaps a few weeks or months, to work in their business assessing their processes and ensuring that they are as efficient as they can be. While there is less commitment to a certification company with this route, there is no proof of your quality management systems at the end of the consultation. Either way, this investment will benefit your company by leaving you with a strong internal structure, the benefit of which will be able to be seen by potential clients, suppliers and partners. In addition, it will mean that your employees have set guidelines to follow, making their jobs much easier and less confused. Having consistency throughout your company will support your sales team, marketing department and other fee-earning team members. By ensuring that your company’s core processes are efficient and strong now, you will be able to rest safe in the knowledge that your attention can be focused elsewhere on more important matters such as growing your business and making money. This article has been written on behalf of QMS International, a UK-based company providing businesses worldwide with ISO certifications. I have seen many companies using substandard management systems and even I have used a couple. You get what you pay for and a good management system will make life a lot easier for you and your customer.